I’ve now received an electronic version of the finished cover of my next juvenile book, Just Call Me Uncle Sam. That’s when I finally feel like I’ve actually published a book, even though it won’t be available for awhile. This’ll be book No. 27 published under my name and various pseudonyms. I’ve written four others that remain unpublished, though I actually got paid for two of those. Two publishers (Doubleday and HarperCollins) signed and paid me for books, then decided they were dropping their western or historical lines before my books were published. Shows you my impact on publishing! 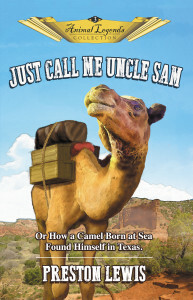 So far Just Call Me Uncle Sam has gotten rave reviews from the sole person other than me and the editors to read it, our oldest granddaughter Hannah, who got tired of waiting for it to appear in print. So, for Christmas I gave her a spiral bound copy of the manuscript. She loved it, especially the lines she, her sister Miriam and her cousins Cora and Carys gave me to include in the book! During a summer visit to San Angelo, I asked each of the girls to come up with a line that a horse might say to a camel, since The Grands were really into horses. The two oldest, Hannah and Cora, came up with “Why do you have a mountain on your back?” and “Why do you have such big feet?” Pretty good lines, don’t you think? At three- and two-years-old, respectively, the younger two came up with more challenging lines. Miriam offered “No, no, no” and Carys presented “Hay, hay, hay” or was it “Hey, hey, hey”? Anyway, I named four fillies—Hannah Horse, Miriam Horse, Cora Colt and Carys Colt—in the book for The Grands and managed to work their lines into the narrative. It’s the type of things writers do to amuse themselves and to bring a smile to their granddaughters’ faces.